Barack Obama's re-election campaign kept up pressure against Republican rival Mitt Romney on two fronts Friday, launching a new ad defending the president's record on Medicare while challenging Romney to release at least five years of tax returns. The TV advertisement - accusing Romney and running mate Paul Ryan of undermining the health care program critical to millions of seniors, came as Romney made plans to spend his time raising money in non-battleground states. That remains a top priority even with the election less than 12 weeks away and Obama making extended visits to toss-up states such as Iowa and Ohio. Obama campaign manager Jim Messina made the tax-disclosure offer to Romney campaign manager Matt Rhoades in a letter Friday morning. Messina said he was taking the step because Romney "apparently fears the more he offers, the more our campaign will demand that he provide. "Romney's wife, Ann, has repeatedly stated that concern in interviews, arguing that the more the couple releases, the more questions are asked. Romney released his 2010 taxes and has pledged to release his 2011 returns. Messina said in letter that he wants Romney to provide three more years of returns. Obama's campaign has questioned whether there are years when Romney paid no taxes. Romney defended his record Thursday, saying he has paid at least 13 percent of his income in federal taxes every year for the past decade. "I did go back and look at my taxes and over the past 10 years I never paid less than 13 percent," Romney told reporters after he landed in South Carolina for a fundraising event Thursday. "I think the most recent year is 13.6 or something like that. So I paid taxes every single year." 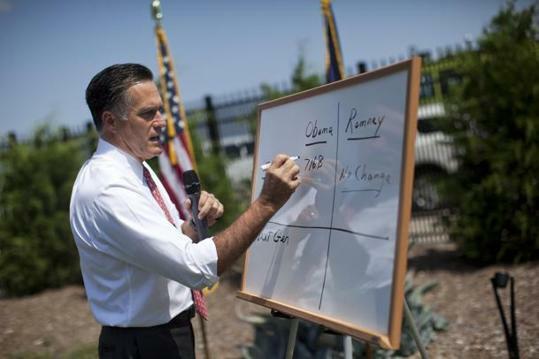 Aides later said Romney meant to say 13.9 percent, the amount he already disclosed for his 2010 federal return. On average, middle income families, those making from $50,000 to $75,000 a year, pay 12.8 percent of their income in federal taxes, according to the nonpartisan Joint Committee on Taxation. In 2010 and 2011, Romney made about $21 million a year. Romney is able to keep his tax rate low because most of his income is from investments, which are generally taxed at a lower rate than wages. That type of legal tax figuring is something Obama has proposed changing, although his campaign notably said nothing about Romney's self-described tax rate itself. In the new Medicare ad, Obama's campaign pointed to the AARP, an organization that represents senior citizens and which said in a letter to lawmakers earlier this year that Ryan's plan to transform Medicare into a voucher-like system would lead to higher costs for seniors. The AARP said that Obama's approach would strengthen the program. Romney has criticized Obama for taking more than $700 billion in Medicare funds to help pay for the president's health care law. Obama's campaign is running the ad in eight states: New Hampshire, Virginia, North Carolina, Florida, Ohio, Iowa, Colorado and Nevada. This comes while Romney is campaigning in Alabama, South Carolina, Massachusetts and New York. He plans visits next week to Texas, Louisiana and New Mexico. To be sure, Obama attends numerous fundraisers of his own. And Romney has spent significant time at public campaign events in swing states, and he will do so many times again before Nov. 6. But the amount of time Romney is devoting to private fundraisers in noncompetitive states is notable. Even when he is in swing states, he sometimes attends only a fundraiser, without mingling with non-donors or appearing before local TV cameras, as he did Wednesday in Charlotte, N.C.
Romney is pouring time into fundraisers even though he has outdistanced Obama on that front for months. The former Massachusetts governor reported raising more than $101 million along with the Republican National Committee in July. Obama's campaign and Democratic National Committee raised $75 million for the month. Romney's money advantage is expanded by technically independent groups flooding airwaves with ads criticizing Obama. Two pro-GOP super PACS - Restore Our Future and American Crossroads - have raised more than $122 million since the beginning of last year. Democratic-leaning groups Priorities USA Action and American Bridge 21st Century have raised about $30 million in that time. You are reading the article instinct blogs - SEO Friendly entitled Obama campaign offers Romney 5-year tax disclosure, We are sorry if you think there is a very important artike, do not forget to subscribe by entering your email in column Get Updates Via Email. If there is a question which if you think do not forget to leave a comment below. Without any spread of SPAM..